New York (TADIAS) — The Amsale Spring 2019 Runway Show was held on Friday, April 13 at The Gramercy Park Hotel in New York City as a special tribute to the legacy of Amsale Aberra. The acclaimed Ethiopian-American fashion designer passed away on April 1st surrounded by close friends and family at Memorial Sloan Kettering Hospital where she was being treated for uterine cancer. 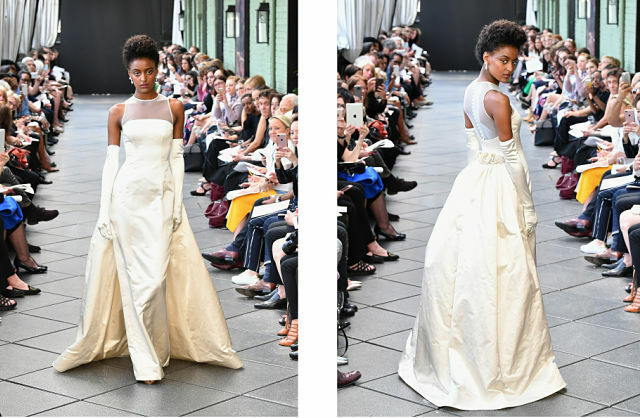 The deeply moving tribute on Friday, which was held on the terrace of Gramercy Park Hotel, featured a new launch of the Nouvelle Amsale collection and closed with a beautiful Ethiopian model wearing Amsale’s first bridal fashion design eliciting a standing ovation from the crowd. Amsale, who was born in Addis Ababa in 1954, moved to the U.S. in the 1970s, was the Founder and Creative Director of the fashion design house, AMSALE, one of the industry’s leading brands in the United States. “For over 30 years, Amsale has been an icon for designs that are powerful in their simplicity. Drama, she believed, emerges when a single, striking detail is offset by a clean silhouette,” the company said in a statement. We featured a profile of Amsale Aberra on the first print version of Tadias Magazine in 2003. Sharing how she built her fashion house, Amsale reminisced about her days growing up as a teenager in Ethiopia and her love of making clothes. “Trying to make something by hand is always something that I liked…At the time I didn’t know there was such a profession as designer” she told Tadias. Amsale had initially studied commercial art and pursued a degree in political science after she arrived in the United States in the early 70s before she attended the Fashion Institute of Technology (FIT) in New York. “When I attended FIT that’s when I truly felt like this is what I wanted to do. That’s how I ended up being a designer,” Amsale told Tadias in an interview on July 2011 shortly after her launch of the Amsale Girls Reality TV show. In 1996 Amsale opened her flagship salon on Madison Avenue in New York and has since launched several lines including the elaborate Kenneth Pool Label (2003) and Nouvelle Amsale (2015). Numerous celebrities have dressed in AMSALE gowns for the red carpet including Halle Berry, Julia Roberts, Angela Bassett, and Salma Hayek. Her bridal and evening wear has been worn by actors in films such as Something Borrowed, When in Rome, and Runaway Bride as well as on TV including in Grey’s Anatomy, Oprah Winfrey Show and The View.